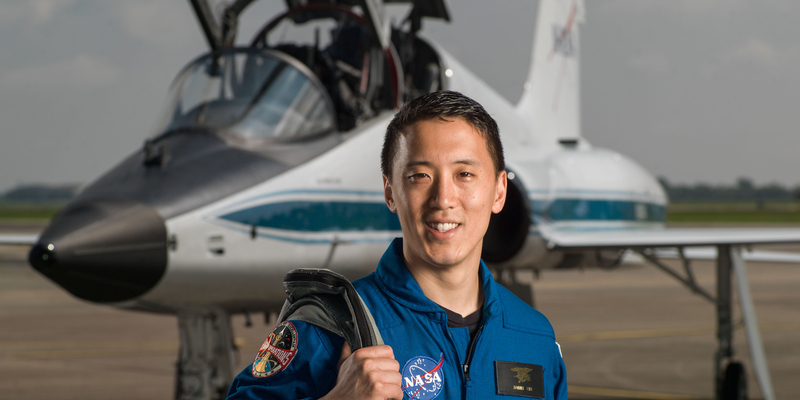 Twelve new astronaut candidates, including a pair of recent University of San Diego alumni, were welcomed and celebrated at a ceremony hosted at NASA’s Johnson Space Center on Wednesday, June 7. Navy Lieutenant Commander Matthew Dominick, a 2005 Shiley-Marcos School of Engineering graduate in electrical engineering (BS/BA), and Dr. Jonathan (Jonny) Kim, a 2012 USD mathematics graduate and active duty reserve with the rank of lieutenant in the U.S. Navy, were among the seven men and five women honored during the announcement. The astronaut candidates — Dominick, Kim, Kayla Barron, Zena Cardman, Jasmin Moghbeli, Loral O’Hara, Jessica Watkins, Frank Rubio, Robb Kulin, Warren Hoburg, Bob Hines and Raja Chari — were introduced by NASA’s acting Administrator Robert Lightfoot and Vice President Mike Pence. The 12 candidates — the largest astronaut class since 2000, according to NASA — emerged from a “record-breaking” 18,300+ applicants. The candidates will return to Johnson Space Center in August to begin two years of training, according to NASA. Then they could be assigned to any of a variety of missions, including performing research on the International Space Station, launching from American soil on spacecraft built by commercial companies, and departing for deep space missions on NASA’s new Orion spacecraft and Space Launch System rocket. Dominick (pictured at left), from Wheat Ridge, Colo., also has a master’s degree in systems engineering from the Naval Postgraduate School. He graduated from the U.S. 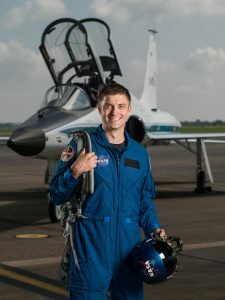 Naval Test Pilot School and, according to NASA’s website, the 35-year-old was at sea on the USS Ronald Reagan serving as department head for Strike Fighter Squadron 115 when he received the call that he’d been selected as an astronaut candidate. In addition to his dual engineering degree, Dominick has minors in math and physics at USD. Kim (pictured above), who is from Los Angeles, currently lives in Massachusetts and is a resident physician in emergency medicine at Massachusetts General Hospital. The 33-year-old Kim earned his doctorate of medicine at Harvard Medical School in May 2016. Prior to attending USD, Kim enlisted in the U.S. Navy, where he trained and operated as a Navy SEAL, completing more than 100 combat operations and earned a Silver Star and Bronze Star with Combat V. To learn more about Dr. Kim while he was a Torero student, read this profile of him that ran in the Spring 2012 USD Magazine. NASA-specific information, photos and quotes provided by NASA website coverage of the June 7 ceremony. Video created and produced by Johnson Space Center, found on YouTube.